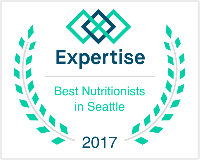 What are your nutrition specialties? What’s the first step in working together? What if I’m embarrassed by what I eat? Will you collaborate with my other healthcare providers? What does MS, RD, CSSD, CD mean? The majority of time will likely be spent learning about you and your unique nutrition situation. We’ll get clear on your wellness vision, and then determine the next most important and attainable steps. And depending on what you need and how much time we have, I may also provide meal and snack ideas, tools, and resources. Bring a filled out copy of the Client Registration & Assessment form, unless you plan on emailing or faxing this to me prior to your appointment. If you prefer, you can also arrive 15 minutes early to complete this form, which will be available on a clipboard outside my office. I recommend you also sign this Release of Information so that I may collaborate with your doctor and/or other health providers to ensure you receive optimal care. If you are planning to use health insurance, please bring a copy of your health insurance card and ID, such as a driver’s license. You can either email me with a brief description of your nutrition situation or book a complimentary 15-20 minute meet & greet session. If it turns out I’m not the best fit for you, I’ll be happy to refer you to at least 1-2 trusted colleagues. I’m in the office on Tuesdays, Wednesdays and Fridays. I often don’t have openings for at least a couple of weeks out. Unfortunately, I don’t have early morning or evening appointments. It depends on your goals. For most clients, having ongoing support and a sounding board helps facilitate sustainable changes and transform their relationship with food, whether that is every 1-2 weeks or every 3-4 weeks. If you mostly need some information and support in choosing which resources to use, you may get what you need in as little as 1-3 consults. I provide a safe and non-judgmental environment for you to explore your food concerns. We won’t be labeling foods “good” or “bad”. In fact, my clients frequently report significantly reduced shame around food after working together. Please call your insurance company to learn the specifics of your nutritional coverage. I am a preferred provider for Aetna, Regence, Uniform, Premera, Blue Cross Blue Shield, Lifewise, Cigna, and First Choice. Also, please note, I’m currently listed under my maiden name, Minh-Hai Tran. For different insurance plans, you can ask your insurance company about out-of-network nutrition coverage or look into one of my package rates. If your insurance does not cover our visits, it will be more cost-effective for you to choose a package deal or pay the discounted rate at time of service, rather than having visits be processed by my insurance billing service. Absolutely, I enjoy working with people of any sexual identity, orientation and cultural background. Yes, I prefer to collaborate with your other providers to ensure you get the highest quality of care. Those struggling with eating disorders need at minimum, a dietitian and therapist specializing in eating disorders, and a primary care provider. What does MS, RD, CEDRD, CD mean? I accept check, cash, along with Visa, Mastercard, American Express, and Discover. For discounted non-insurance rates, payment is due at time of service. You can also make a an online payment here. Yes, I do have a 24 hour cancellation policy. If you need to cancel a Sunday appointment, please do so before noon the Friday before so that I have time to schedule someone else in your time slot. The late cancellation fee is $75 for a 50 minute appointment and $50 for a 30 minute appointment. By scheduling an appointment, you are making a commitment not only to your health, but to me as well. I appreciate your consideration in this regard. There is street parking and a cash-only pay-parking garage on the east side of the building ($3 before 5 PM and $10 after 5 PM, 7 days a week).